China’s real estate market remains an anomaly and has charted exemplary growth in the last decade, buoyed by the country’s high economic growth and higher disposable incomes that has given rise to burgeoning demand for property assets. Since early last year, the real interest rate in China has moved further into negative territory owing to the persistent rise in the consumer price index. Real interest in June 2008 was down to -3.77% (it hit a high of -5.37% in February 2008) as compared to -0.4% early last year. To protect real purchasing power against inflation, consumers will seek to invest in property to preserve the value of real income. Given that real interest rates are likely to stay low or remain negative for some time, high investment demands will bring further growth to China’s property market. In addition, the positive wealth effects arising from the spectacular rise in China equity markets in over the past couple of years, coupled with the strength of the yuan, have added to the sector’s allure among both local and foreign investors. Shanghai, Beijing, Guangzhou and Shenzhen are among China’s Tier-I cities most sought after by foreign investors, given their high levels of urbanisation, mature property markets and extensive supply of quality buildings. In Beijing, the real estate industry remains the backbone of the local economy. In 2007, investment in Beijing’s real estate market increased 16% y-o-y to 199.58 billion yuan (RM96.6 billion), despite a hold-and-wait strategy adopted by some investors. However, concerns about asset price inflation fuelling investment bubbles have led to government restrictions such as tighter monetary policies to absorb some of the excess liquidity as well as investment policies to curb speculation. These measures include the introduction of higher minimum down payment, higher sales tax on residential properties owned for less than five years, nationwide 20% capital gains tax and additional restrictions on foreign investments. In 4Q07, China’s real estate investment witnessed a slowdown following the implementation of the land appreciation tax as well as additional restrictions imposed on foreign investment in the sector. The tightening policies by the Government led to a mild correction in the property market in the 4Q07-1Q08 period, with transaction volume dropping by 51% q-o-q and 1% y-o-y in 1Q08. However, the partial recovery in March sales volume in major cities shows that fear of further deterioration is subsiding. So far, the government’s tightening policies have been successful — prices have stabilised, while volumes have contracted. We believe the current correction is beneficial for the development of a sound and sustainable property market. We further anticipate strong competition and stricter restrictions on foreign investment in the Tier-I cities to result in foreign investors shifting their preference to Tier-II or Tier-III cities such as Chengdu, Chongqing and Hangzhou. On the lending side, real estate loans appear to be less readily available than they were 12 months ago. Banks, encouraged by the China Banking Regulatory Commission, are tightening their criteria for lending and strict loan quotas have been introduced. Recent increases in the reserve requirement ratio for banks serve as a further constraint on lending. Where loans are available, they are at lower loan-to-value ratios, and are charged higher interest rates. Ironically, latest figures show that domestic lending to the sector remained high at 28% in March 2008 (Dec 2007: 32.2%). Given that China’s share of mortgage loans to GDP ranks amongst the lowest at 10.8%, the risk of incurring a US-style subprime mortgage crisis is well contained. Nevertheless, China’s real estate market is still subject to the consequential effects from a slowdown in the US economy, given the dominant role that US consumers play in driving the demand side of the world economy. However, China’s real estate market is expected to continue to benefit from the country’s strong economic fundamentals. The real estate market will also get a boost from the 2008 Summer Olympics in Beijing. Nevertheless, we caution that valuations post-Olympics in Beijing and Shanghai’s real estate markets could see considerable adjustments to rentals and demand. Judging from the first fourth months of 2008, Beijing’s residential market has softened slightly as supply and transaction volumes have started to taper off. Prices, however, continue to rise, albeit much slower than in 2007. Supply and demand volumes during the period were 34% and 54% lower than a year ago. Despite a decrease in transaction volumes, investments in the residential market, which has been on the rise since 2001, continued to grow in the first four months of 2008 to 21.6 billion yuan, up 4.3% from a year ago. In Shanghai, the housing market is expected to encounter a mild correction in 2008. On the high-end side, the market remained active in 2007, despite government efforts to curb the present excessive liquidity through restrictive mortgage lending and limited land supply for high-end residential developments. Growth was supported by higher demand for high-end properties as long-term investments, as well as the continuous inflow of expatriates. The new supply of luxury residential homes is expected to reach 3,659 units in 2008 versus 3,303 units in 2007. 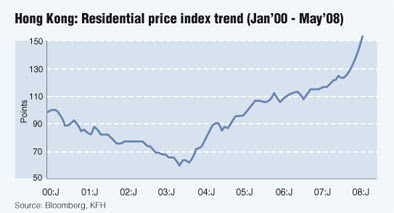 Hong Kong’s Residential Price Index has continued on its uptrend into 2008. In 2007, the index grew 25.7% y-o-y to 145.9 points (2006: 9.2% y-o-y). As at May 2008, the index rose to 32.1% y-o-y to 161.8. In 4Q07, prices for luxury residential in The Peak recorded the highest growth among the traditional luxury districts. The average luxury residential price increased 6.4% q-o-q from HK$20,124 (RM8,557.79) per sq ft in February 2008 to HK$21,419 per sq ft in May 2008. China is currently moving towards a more service-oriented economy. This, coupled with the increasing number of multinational companies that have established a presence in China, is stimulating demand for quality office space, particularly in cities such as Tianjin, Nanjing, Wuhan, Qingdao, Dalian, Chongqing and Chengdu. In Beijing, more than 1.6 million sq m of Grade A office space was launched in 2007, more than double that of 2006. New office spaces in the prime CBD and its vicinity accounted for nearly 45% of the total supply. In 2008, the Beijing Grade A office market is expected to see 1.3 million sq m of office space in the pipeline, in particular in the prime CBD, which is expected to put some pressure on the market. Demand for office space remained strong in 2007, with the annual take-up increasing by 12.8% y-o-y to 0.8 million sq m. As a 1Q08, the total take-up of the Beijing Grade A office was 209,354 sq m. Most of the new lease tenants came mainly from the banking and financial sectors, insurance, professional services and high-tech sectors. Average rentals in the Grade A office market remained robust throughout 2007, reaching US$23.80 (RM79.73) per sq m per month in 4Q versus US$22.60 in 3Q07. This year, we expect average rentals for office buildings to continue to sustain its steady growth, despite the large supply expected to come on stream, given the continued demand for high quality office space. The liberalisation of the China’s banking sector and Shanghai’s emergence as a major financial centre has buoyed demand for office space in Shanghai. In the Grade A segment, net absorption amounted to around 263,000 per sq m in 2007 as tenants sought quality space in the city for expansion, upgrading and relocation. In 2008, we expect the demand for Grade A office space to continue to increase, given the rise in business expansion plans, particularly from foreign banks, financial institutions, as well as professional firms. The Shanghai Grade A office market supply is expected to increase to 843,300 sq m in 2008, mainly in Pudong area (608,900 sq m or 72%) of which the Shanghai World Finance Centre alone will contribute some 226,900 sq m, Jing’an (163,400 sq m) and Putuo (75,000 sq m). The increased supply of Grade A office space will slightly push up the vacancy rate in 2008, and cause rentals to soften to approximately 2% versus 11.3% in 4Q07. The average rents in Shanghai’s office market continued to rise, increasing by 2.8% in the 1Q08 to 8.4 yuan per sq m per day (US$36.4 per sq m per month), underpinned by strong demand for prime office space in both the city’s eastern and western office precincts. Given the limited availability of urban sites as well as surging land prices in Tier-I cities, foreign developers have increasingly shifted their investments towards Tier-II cities. Rapid urbanisation in Tier-II cities is expected to translate into steady demand for residential units. In the office market, growth in the Grade A segment has been driven by interests from well-known developers, the entrance of multinational companies, as well as the push by the local governments to create more attractive CBDs. We expect the demand for Grade A offices to continue to increase in the coming years, underpinned by continual influx of multinational corporations which will stimulate the demand for quality office space in cities that have the potential to become a regional service centre. The move also coincides with the government’s emphasis on Tier-II cities with strong economic prospects as part of the government’s efforts to narrow the wealth gap between eastern coastal cities and their western brethren. In recent years, the government has introduced tax incentives and encouraged infrastructure investments to attract companies into China’s interior. For China’s next phase of development, the country’s Tier-II cities are expected to provide more opportunities for property investors, in particular cities with high population as well as per capita income. There are currently 57 cities in China with a population of over one million and per-capita GDP of above US$3,000. Out of these, 14 are located in the Yangtze Delta, nine in the Guangdong province, and six in the Shandong province. These cities generated 43% of the national GDP in 2005. SHANGHAI: Global buyout funds and property investors including Blackstone Group are vying to buy up to four commercial buildings in Shanghai for as much as US$1 billion (US$1=RM3.32), three sources with direct knowledge of the matter said. Super Ocean Group, whose chairman is high-profile businessman Ye Lipei, has put a package of four buildings on sale as it seeks cash to support its growth in other sectors, the sources said yesterday. The four buildings to be sold by Super Ocean include the Bank of Shanghai tower in the Lujiazui area of Shanghai's Pudong financial district, and Southern Securities Mansion, located on Nanjing Road, one of China's busiest commercial streets, the sources said. Super Ocean aims to sell the four buildings together but potential bidders have the option to purchase three of the four, said the sources, who did not want to be identified because the deal was not finalised. They put the price tag for the deal at five billion to seven billion yuan (100 yuan = RM48.38). Representatives for US-based Blackstone could not immediately be reached for comment. Super Ocean declined to comment. Two of the three sources said no deal had been reached yet and talks between Blackstone and Super Ocean could collapse over valuation of the buildings. The other source said Super Ocean aimed to complete the deal by the end of this month. "It's not easy for Blackstone and Super Ocean to reach a deal as Super Ocean is probably asking too much for these properties," said one of the sources. "There are also concerns about the ownership structure, which is a bit complicated for some of the four buildings," he added. The seven-billion-yuan price tag for the four buildings in the proposed package deal was offered by Super Ocean late last year for bidders' reference, though the final price could be lowered amid concerns about global property investment. In China, the government has clamped down on bank lending for construction and imposed various measures including taxes and new rules to try to stamp out property speculation. Although aimed at the residential market, the steps are cooling appetite for land and starving property firms of funding, so could also put downward pressure commercial property prices. Besides Blackstone, other potential buyers include Ireland's Treasury Holdings and an Australian asset manager, which the sources declined to name. Negotiations between Treasury Holdings and Super Ocean stalled over price issues several months ago, said one source. But Blackstone and the Australian fund are still seperately in talks with the Chinese developer, the other sources said. PENANG’S investment agency has unveiled its Budget 2009 wish list which includes a request for an investment promotion grant and lower taxes for small businesses. The list, drawn up with feedback from foreign and local manufacturers, has been submitted to Prime Minister Datuk Seri Abdullah Ahmad Badawi last month. “The proposed investment promotion grant can be disbursed to every state investment promotion agency in the country for investment promotion and investor facilitation purposes,” Invest-in-Penang Bhd (investPenang) executive committee chairman Datuk Lee Kah Choon told a media briefing in Penang yesterday. * the continuation of planned infrastructure projects. Penang is currently home to an estimated 1,500 small and medium sized enterprises (SMEs) and Lee said firms have proposed that corporate tax be reduced gradually from 26 per cent to 15 per cent over five years. On the request for the revolving fund, Lee said that currently, investors need ready-built facilities which meet their operational specifications. “Investors prefer not to own the property initially but rather lease it with an option to purchase it later. “This is why we are proposing the establishment of the fund in the form of soft loans of between zero and four per cent interest rate be given to the public sector developers, like the Penang Development Corp to construct purpose-built buildings,” he said. PETALING JAYA: It was all quiet on the central front for property-based Malaysian Pacific Corp Bhd (MP Corp) due to a delay in the sale of its Wisma MPL in Kuala Lumpur. The delay was due to its strategy for a partial sale with a view for joint development of a tower block rather than an outright sale of the entire property. Such a joint venture was in the best interest of the company and its shareholders, as management worked towards obtaining a better price and terms, the company said in its latest results announcement. There is, in addition, a southern front in the group’s development strategy. It has about 500 acres of freehold land near Pasir Gudang in Johor that is master-planned for its proposed LakeHill Resort township. 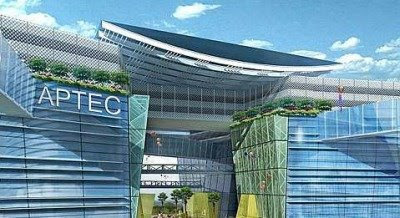 That may sound like just another township but one of its components is the proposed Asia Pacific Trade and Expo City (Aptec). This will be developed as a wholesale trade and distribution hub, with proposed participation from merchants and manufacturers from China, India and other countries in Asean. The Federal Government is understood to be interested in supporting and participating in the LakeHill project. Hence, one of its agencies is expected to sign for a stake in the project next week. With the Government as a partner, development of the whole project, including Aptec, should be facilitated. The concept for Aptec is that products from the region will be brought to one location for the convenience of buyers instead of them having to fly to each country to view the products. In addition, the whole project is within the Iskandar Malaysia area in Johor which the Government is keen to develop. MP Corp is applying for Iskandar development region status for the LakeHill project so that companies operating there will qualify for tax incentives. Industry sources said it was also planned that a foreign party, expected to be China-based, would take a stake in the LakeHill project. Equity participation by both the Government and, in particular, the Chinese party, was envisaged to erase or reduce the bulk of the bank borrowings of the MP Corp group. The group had borrowings of RM178mil against an investment property valued at RM225mil and land held for development of RM139mil. The group’s shareholders funds totalled over RM200mil at end-March. Finance costs amounted to RM11.4mil in the nine months to March 31, 2008, and the group is working towards the right direction to reduce or eliminate that. MP Corp is led by Datuk Bill Ch’ng, an architect who became a developer and businessman many years ago.